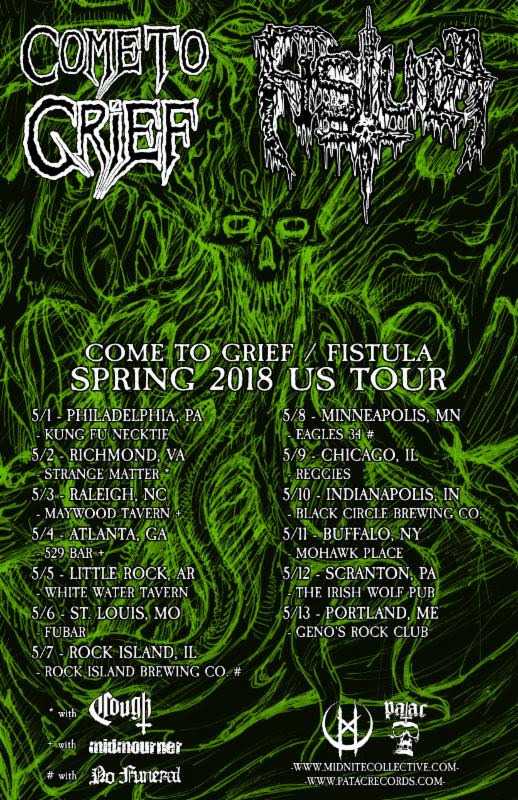 This May, things are going to get even grimier as Come to Grief and Fistula embark on a tour together. They recently put out a split EP in celebration of Fistula’s twentieth anniversary (which I shared my thoughts on here) and now comes the time to spread that misery music in person. The tour commences in Philadelphia, Pennsylvania on May first and will conclude May 13th in POrtland, Maine, leaving thirteen cities smouldering in their wake. Select dates will feature other heavy weights such as Cough, Midmourner and No Funeral. Check out the dates below! If you aren’t on the Fistula train already and still need convincing, here’s some live footage of them from a few years ago tearing up the stage at the Roadburn festival.